Caitlin has one of ‘those’ dads and is being pushed. SNEAKILY squeezing in a session here and there into her well-loaded physio schedule. 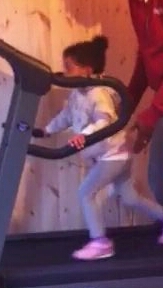 Here she breaks into a decent-gaited sprint on our generously loaned treadmill.